Gurugram: India’s favourite airline, SpiceJet, was honoured with the ‘BML Munjal Awards 2018’ for ‘Business Excellence through Learning and Development’ at a grand awards banquet held at Taj Palace, New Delhi on April 19, 2018. 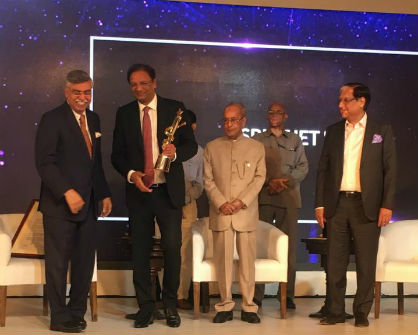 Ajay Singh, Chairman and Managing Director, SpiceJet, received the prestigious award from Shri Pranab Mukherjee, the former President of India. “I am honoured to receive this award. This is a recognition of SpiceJet’s spectacular comeback and remarkable performance. We have achieved what very few airlines in the world have managed and I share this award with each and every SpiceJetter who has been a part of this magnificent journey,” said Mr. Ajay Singh, CMD, SpiceJet. A distinguished ten-member Jury Panel, which comprised eminent names like Mr. Arun Kumar, Chairman & CEO, KPMG India, Mr. B. Ashok, CMD, Indian Oil Corporation, Mr. R.C. Bhargava, Chairman, Maruti Suzuki, Mr. Ashish Kumar Chauhan, MD & CEO, BSE Limited, Mr. D K Sarraf, CMD, ONGC LTD. and Mr. T.V. Mohandas Pai, Chairman, Manipal Global Education selected the winners. The first quarter of 2018 saw the airline acknowledged with lead industry titles and recognitions such as the ‘CAPA Chairman’s Order of Merit for Excellence in Indian Aviation Award’ and ‘EY Entrepreneur of the year 2017 for Business Transformation’ presented to Mr. Ajay Singh besides SpiceJet being conferred with India’s ‘Best Domestic Airline’ Award at Wings India 2018.